The Atari5200...that huge console that Atari only released in North America that was also known as the Super System. The console that originally was referred to as the Video System X. We've yet to really discuss the system, so I figured it was time to start a thread to talk about the console itself. We have plenty of reviews that I've written for its games, so be sure to take a look there as well. To get things started, I'm going to post this video review from Classic Game Room. Do you agree with his comments about the system? Did the system deserve the Super System moniker? Let the discussion start! If i had the money, i'd buy everyone of those games featured in the photo there, i just love 2600 (and now 5200) box art!. Without a doubt, Atari had a knack for getting some very nice covers done. Bloody hell! That must take up half your house! was so f'ing big, quite honestly, they could have fit an Atari System 1 Arcade board in there...not an already outdated A8 with a new memory map....how friggin stupid was that? to handle the maria so the main processor could still compute. I have a four port and it's just collecting dust. I'd just assume use my A8 anyway. Design wise, it looks very much like the Xbox of it's day, i.e huge, which means i'll never mock the N64 Tomy stlye look ever again.It also seems to have been designed by a group of mangers just throwing key words around during a brainstorming meeting and things being ticked off without any real thought. In terms of concept, i can see what they were aiming at as things like 4 controller ports, numeric buttons on the controller and analog control, would offer better precision, potential for deeper games etc etc, but somewhere between what sounded great on paper and what was actualy made a reality, things went badly wrong. That All-In-One RF/AC power cord come box thing? never seen anything like it! hell, who on earth signed off on that? yeah, lets have audio, visual and power going through same cable, we'll just have it going into another chunky box (did it ever cause any interference issues? ), mind you, looks like they built the damn thing to last, lol. The 5200 appears to be Atari just buying some time, ie get something more advanced the aging 5200 out there as competition (judging by US magazine ads i've seen) were busy comparing their versions of games to the versions the 2600 recived and the 2600 was looking rough, whilst they worked on a 'true' follow up (going purely from what i've taken from the video), would this be fair to say?. But it appears this stop-gap move back fired badly-if people wanted better looking versions of games they could buy on the 2600, there were other choices on the market and Atari serving up 'enhanced' 2600 carts just was''nt going to cut it.Kind like in many years to come, were PS2 owners going to upgrade to an Xbox, just for some minor cosmetic enhancements? no..it need the exclusive, Triple-A titles of it's own to shift systems. What such titles did the 5200 have to offer?. The controller though, sounds like a deal breaker (and i'm someone who got on fine with Jaguar pad+original Xbox pad). I believe onthinice owns a 5200. I've never played on the console myself which isn't too surprising given that Atari never officially sold it over here. That said, Atari UK marketing chief Darryl Still reputedly was once in possession of a PAL 5200 supplied to him by Atari - he may still own it along with the demonstration kiosk it came supplied with. Video talk of enhanced 2600 games, so technically what did it offer over the 2600? exact ports at home. Paperboy, Stunn Runner and all thouse of that time period and after. Putting existing A8 micro hardware inside is reason i thought it smacked of just get something better out there, fast!.No real long term planning by Atari. It was a very bad decision and if Nolan had been still running things it would have never happened this way. Surprised at all the hate honestly, I guess it has something to do with low footprint in the UK? The 5200 is my favorite classic system. The Jaguar is first overall, but for 8-bits, I love the 5200 more than the rest. To me, it was like having the arcade games in your home. Remember that even though it is technically an 8-bit computer consolized, 1983 didn't see widespread adoption of home computers in the states, at least they weren't marketed to gamers. So in that sense, I think the 5200 was it's own beast, as it was marketed to a completely different segment of the population. Computer nerds and gamer nerds weren't necessarily in the same category. This fixes most of the control issues of the games, making for a much more sound arcade experience on the Supersystem. Let's not forget the arcade-quality Trak-Ball that was produced, for use with Missile Command and Centipede, creating a true arcade experience that was unmatched in it's era. 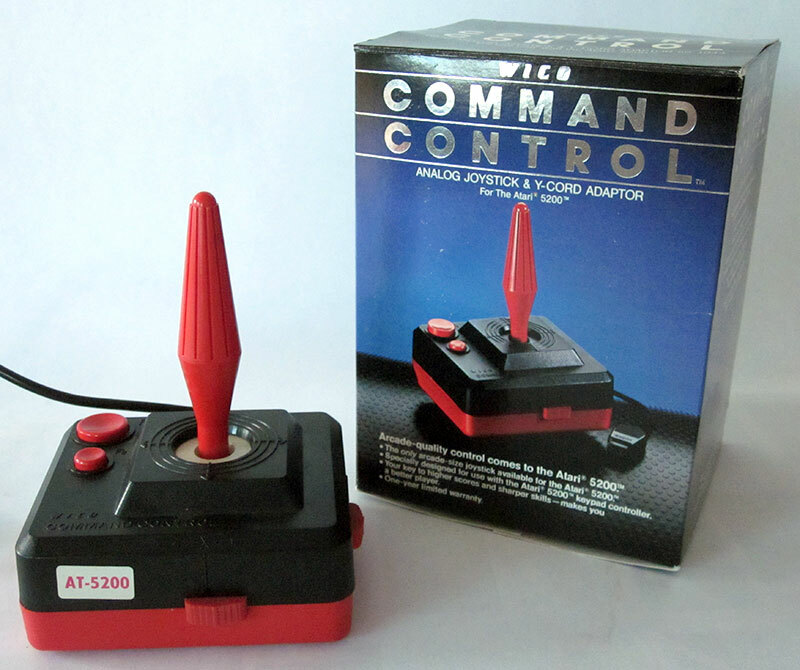 The original 5200 controllers do come in handy for use with a few games however, by using the joystick coupler that was included with Space Dungeon and Robotron, and it's not bad with the excellent Star Raiders. I was always fascinated by the 5200, it was a taste of extravagance in home gaming to me, a poor boy. Originally I could only play it at my cousin's house, who was more well off than my family. Eventually I was able to get my own later in life, and I now have a pretty decent 5200 collection, but it could be much better. Not nearly as good as my Jag and Lynx collections. Anyway, great console, the Supersystem! I'm not familiar with that joystick. I'll need to see if I can get my hands on one of them! Looks sturdier than the Wico stick. I have to wonder if the decision by Atari to not sell the 5200 outside the US was because they saw the system as a short-term solution until they had something better ready, because there was a technical reason, or simply because someone just made a poor decision. It would have helped sales had it been released out of the US. Or have i been reading too many UK publications of late?.